Who doesn’t love that feeling of baby-smooth skin right after you’ve scrubbed-down with a hearty exfoliator. Your skin is glowing and your moisturizer just glides on and absorbs like a dream. If you get too addicted to that sensation, that smooth, soft skin will likely turn to redness and flaking—the total opposite of what you’re going for. Over-exfoliation is so easy to occur with too vigorous or too often a scrub, and sometimes you won’t even realize you’re going too hard with the exfoliation until your skin rebels. That said, your skin does naturally shed itself and grow new skin cells—it’s constantly doing that actually. You don’t need to do too much to help it along, but it definitely benefits you to exfoliate at least once or twice a week to remove dead skin that might be hanging on, impeding newer skin cells from turning over. You don’t even have to scrub hard–the mantra should more-so be: scrub soft, scrub often (not the other way around). Chemical vs. Mechanical. If you have sensitive skin, a chemical exfoliant might benefit you. Sounds weird, but manual exfoliation–physically scrubbing– can really do a number on your sensitive skin. The chemicals in AHAs and BHAs (in small concentrations) are great to use in a toner, cleanser, or treatment. An added benefit of using a chemical exfoliant is that it helps reduce acne without further irritating it. The main difference between AHAs and BHAs is that AHAs are water-soluable and BHAs are oil-soluable, so AHAs are better for removing dead skin cells on dry skin and BHAs are great for penetrating oily skin and pores. “Erase” Your Dead Skin. Other than mild acids, there are even gentler chemical exfoliants that act as “peelers.” Not quite a peeling mask and definitely not a chemical peel, these exfoliators generally come in a gel that you apply onto dry skin, allow it to emulsify for about 30 seconds and then rub gently as it adheres to and wicks away all your dead skin cells like eraser dust for you to rinse away. Some of them do include AHAs however. Kind of gross, but extremely effective and no “scrubbing” necessary. Think of them like a lint roller for your face. Soft Scrubbers Only. 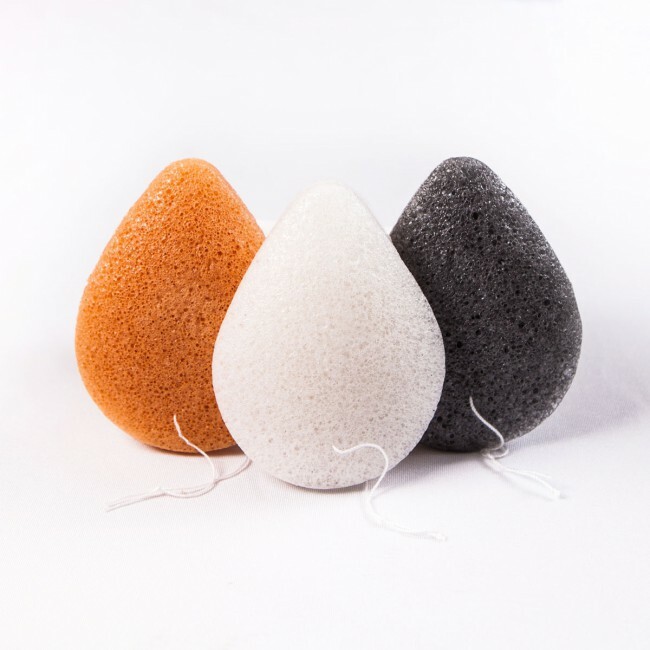 Konjac sponges are having a moment now, just like beauty blenders had their moment not too long ago, and for good reason. These sponges, made from the root from the konjac plant, feel just like kitchen sponges when wet, but when dry are airy and hard like pumice. They’re great because since they’re so gentle, you can use them every time you wash your face and it’ll help remove makeup more effectively and remove dead skin cells without over-doing it. They come in all variations—some with activated charcoal, green tea, clay—all for different purposes, like acne, sensitive skin, and generally drawing out impurities. Only catch is that these sponges have a shelf-life of about three months, if you treat them right. You’ll notice after frequent use that they will start to come apart. Sponges retain moisture, making a prime environment for germs and bacteria, so you definitely want to replace them regularly. Washcloths are another good option, as long as they aren’t too rough. Even a good old terrycloth washcloth will exfoliate gently and get your skin clean. There are plenty of options especially for your face out there, some made of bamboo and other soft fibers so as not to give you that “just came in from the cold” look, so shop around. MORE: Should You Be Using A Washcloth In Your Skincare Routine? Avoid Brushes. People swear by facial brushes, but the fact is that an oscillating/vibrating brush is far too rough for your skin. You’re basically doing to your skin what an electric toothbrush does for your teeth—scrapes away stubborn gunk. Rarely is there anything too stuck on your face as there is plaque on your teeth (gross but true). The gentlest brush-head could benefit someone with normal to oily skin once a week, but anything rougher or more often can do more harm than good. When you over-scrub, you’re pretty much ripping off the layer of barrier skin cells there to protect your skin from germs and bacteria. You may find that doing so causes more acne and blemishes despite your efforts.